Here's my card for the current My Favorite Things Wednesday Sketch Challenge. I used an image from the Beary Special Birthday stamp set that I'd colored for the Daily Marker 30 Day Coloring Challenge as my focal image. After I colored the bear with Copic markers, I used the coordinating die to cut out the colored image. The image was adhered to a pale blue circle nested inside of a stitched circle frame. I adhered the circles with the image to a green card base covered with a multicolored striped panel. 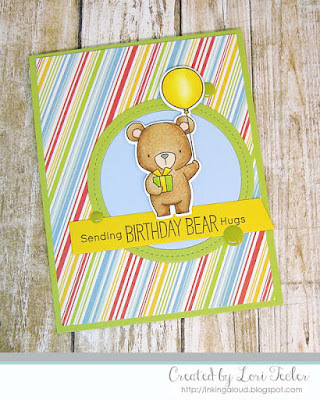 One of the set's birthday sentiments was stamped on a yellow slanted sentiment strip, then positioned on the cardfront just underneath the bear image. A trio of green enamel dots arranged around the round frame completed the design. Awe, this is just too cute!